He is a doctor, Educationalist and Philanthropist. He did MBBS and MD in Stanley Medical College, Madras and served as Lecturer and Assistant Professor of Medicine at Coimbatore Medical College in the year 1973 – 1975. He went to USA in the year 1975 for his higher studies and completed higher training in Internal Medicine at Cincinnati, Ohio and Wayne State University at Detroit, Michigan in the year 1975 – 1978. Did fellowship in Endocrinology and Metabolism at Wayne State University, Detroit, Michigan in the year 1983 – 1985. Between 1978 and 1983 worked as internist at St.Joseph Hospital, Mt.Clements, Michigan, U.S.A. 1985 – 1990 Staff, Hypertension, Obesity and Risk factor, department of Wayne State University at Detroit, Michigan. 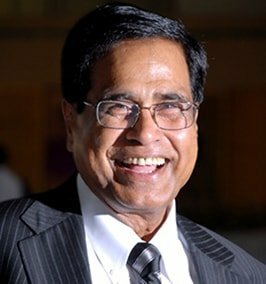 Conceived the idea of establishing a hospital comparable to American Hospital in India, He worked on the project of Kovai Medical Center and Hospital at Coimbatore in the year 1985 onwards. Joined along with N.R.I. 's from USA, UK, Australia, Middle East and people from India, he established KMCH and it started functioning from June 24, 1990. Since then KMCH is serving the community with dedication and commitment. Started with 200 beds and it has emerged as 800 bedded multidisciplinary Super Specialty Hospital. Apart from the Health Care and Educational Activities, he is carrying out many community services to the rural and needy people. As a part of his service, the KMCH has set up 6 community rural and women centers to serve the poor and needy with association of Rotary clubs, St. John service organizations, KMCH has established trauma and First aid center at Kunnathur, Coimbatore district, Palla Goundanpalayam, Perundurai and Erode. While in USA, as a Director of Tamilnadu Foundation, started the Rural Health and sanitation program for Tamilnadu. Established a model sanitary program at Naduvalasu – Nallampatti village in Erode District. To train the villagers to familiar with sanitation habit, established model latrines and model education program to use foot wares and educating clean habits among the villagers. He has donated computers to Government schools and built toilets at Board high school Perundurai and schools in Erode and Coimbatore district (Thadagam area). Scholarships and award to students of schools at Nallampatti and Perundurai since 1977. Many students are given free education and scholarships in his educational institutions. Helped to renovate temples especially for Dalit people in Nallampatti and Thadagam villages. Notable works were done in Anuvavi Subramanian temple and Maruthamalai Murugan Temple. He is recipient of many awards from medical, educational and community organization for his services. His mission is to serve the people of India in Health Care and Education on par with developed countries in the world. His renowned services in the Health Care Sector and Educational activities in Health Sciences, Arts and Science and Engineering and Technology field made him an icon of Kongu region. Recognizing his outstanding services in the fields of Health and Education, Bharathiar University, Coimbatore has honoured him by awarding D.Sc (Honorius Causa) during the Convocation held during October 2011. The Tamil Nadu Dr. M.G.R Medical University, Chennai honoured him with Lifetime Achievement Award for his excellent service in Health Care during its Silver Jubilee Convocation held in the month of February 2012. The Rotary club of Coimbatore has honoured him by offering For the Sake of Honour Award for his service to the people of Coimbatore and its surroundings. Kongu Maamani Award have been conferred to Dr. Nalla G Palaniswami for rendering yeomen service to the community. This award was given by Chennai Kongu Nanbargal Sangam on July 28 th 2013. Life time achievement award conferred to Dr. Nalla G Palaniswami by Tamilnadu state IMA on the eve of Doctors Day Function held on 27th July 2013 at Chennai. Best doctor award given to Dr. Nalla G Palaniswami by Indian Medical Association Coimbatore branch on the Doctors days function held on 18th august 2013 at Coimbatore. Started in the year 1997, the college has been recognized by the Government of Tamil Nadu, affiliated to Bharathiar University, Coimbatore (AUTONOMOUS) and Re-Accredited by NAAC WITH 'A' GRADE. The college presently offers 28 Under Graduate programmes, 14 Post Graduate programmes, 12 M.Phil and 11 Ph.D programmes, 05 PG Diploma courses, 07 diploma courses and 05 certificate courses. THE NGP SCHOOL is a Co-educational Institution. It provides an opening to develop headship qualities of both boys and girls. Our school aims to build up the children as a whole rendering excellence in education through well educated and trained governance. Apart from adhering to the curriculum set by the Board, our Institution formulates special programs based on specific requirements. We aim to generate high profile children who can headstart successful careers throughout the world.